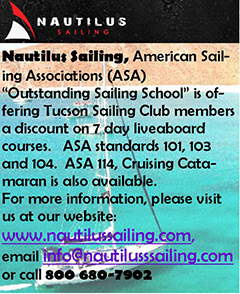 The Tucson Sailing Club was founded over 40 years ago to promote, protect and foster the sport of sailing: to encourage the members to become familiar with and adhere to the rules and laws of navigation and seamanship, and to promote and encourage sociability and friendship among it’s members. Online application. Click here for the online registration form. When you apply online, you can also pay the fee online. You can also use our Contact Us form for any questions about the club. Initiation Fee is $50 for new members. Annual Club Dues are $60 for family membership and $40 for single membership. Corresponding Membership is $15 – Windbreaker only, no club privileges. BYLAWS ARTICLE XI: MEMBERSHIP Section 3. Corresponding membership shall be by invitation only and shall be extended and granted to any sailing enthusiast residing outside a 150 mile radius from Tucson Arizona pursuant to written application on forms prescribed and provided by the Club. Corresponding Members will pay an assessment selected by the Treasurer and approved by the Executive Committee, which will cover expenses of sending Club correspondence to the said members. In early December, you’ll receive an email invoice, which you can pay online, to ensure your membership stays active. If you did not receive the email, you can also renew online by logging into the membership area of the site. 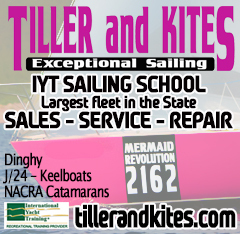 If you’d rather pay your renewal by check, please make your check payable to “Tucson Sailing Club” or “TSC” and mail to the Membership Chair. With your renewal, please note any change to your address or phone number. The club will be enforcing Article IV, Section 4 of the Bylaws, stating that any member in arrears for dues or other indebtedness to the club beyond March 1 shall automatically be suspended from membership and denied the privileges of the Club. Any member suspended under this section may be reinstated upon payment of such indebtedness and a five dollar ($5.00) penalty.